Patmos is a small Greek island in the Aegean Sea. One of the northernmost islands of the Dodecanese complex. Patmos is mentioned in the Christian scriptural Book of Revelation. 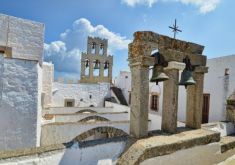 The book's introduction states that its author, John, was on Patmos when he was given a vision from Jesus. Early Christian tradition identified this writer John of Patmos as John the Apostle, though some modern scholars are uncertain. 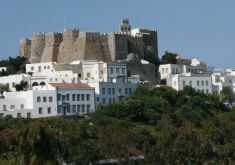 As such, Patmos is a destination for Christian pilgrimage. Visitors can see the cave where John is said to have received his Revelation (the Cave of the Apocalypse), and several monasteries on the island are dedicated to Saint John.